This tutorial will walk you through the installation of MvvmCross into a new Universal Windows Platform project. 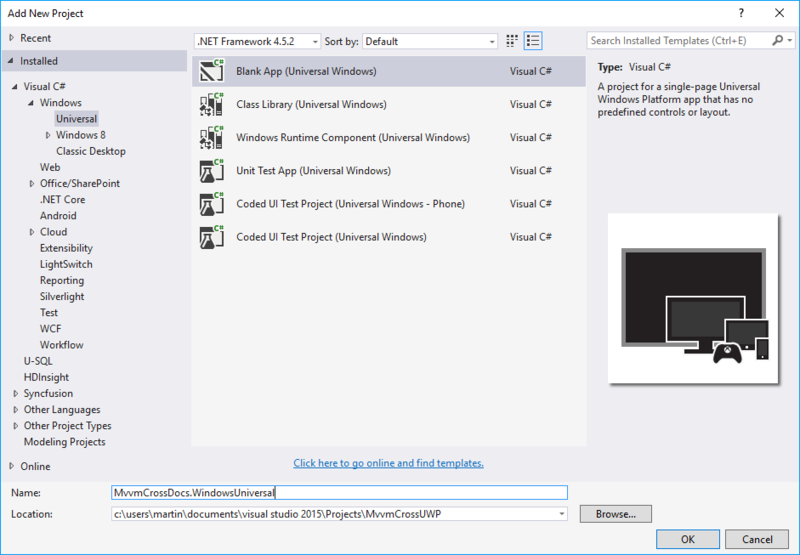 In the Add New Project dialog select the Windows Universal tab and select the Blank App template. In the bottom you can set the name. 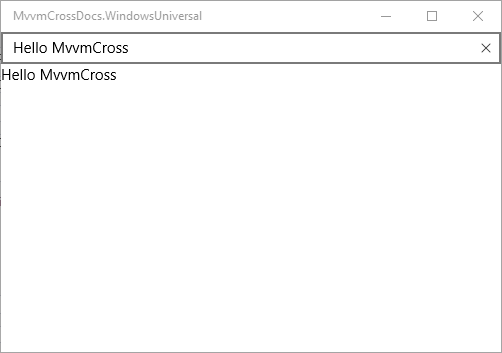 We will use MvvmCrossDocs.WindowsUniversal in this example. Now, we will open the New Project dialog again and create a Portable Class Library, that will act as the Core shared library in MvvmCross. In the dialog click the Visual C# node and find Class Library (Portable for iOS, Android and Windows). Name the project, in our case MvvmCrossDocs.Core. We will now want to reference the Core project inside of our Universal Windows project. To do that, right-click the References node under the UWP project in Solution Explorer and select Add reference…. In the opened dialog navigate to Projects -> Solution in the left-side pane and then check the box next to our Core project in the list. Our projects are now ready and we can install MvvmCross from NuGet. First right-click the solution in Solution Explorer and then select Manage NuGet Packages for Solution. In the NuGet Package Manager window choose the Browse tab and enter mvvmcross into the search box. MvvmCross package should appear as the first result, which you can select and then check the boxes next to your project names in the right hand pane. When you are done, you can click the Install button to install the package. The installation might take a while and you will be prompted to agree with the changes. Confirm the prompt with OK and continue. Now we will need to add some basic code to get MvvmCross up and running. As you can see, in this code we are registering a first view model, which we will create now to be able to demonstrate the functionality of our setup later. Create a folder called ViewModels and inside a new file FirstViewModel.cs. Finally, we will create a sample view. Create a folder Views in the UWP project and create a new XAML Blank Page called FirstView.xaml inside. Now everything should be correctly set up and you can try to launch the application. If everything is correct, you should see a UI very similar to the following. Change the contents of the TextBox, and click elsewhere. The text below the TextBox should automatically update, proving that the data-binding is working as expected. This section shows how to abstract Universal Windows Platform Page object to provide generic ViewModel binding.